We are immersed in that time of year in the Pacific Northwest when it seems as if we will never see the sun again. While I remind myself that at least we don't have to shovel rain, it does get a little wearing. We need to keep lights on in the house during the day and yesterday when I was driving at noon, I felt I needed my headlights. On the bright side, as I was walking Maggie during a rare break in the rain the other day I saw some bulbs poking their little heads out of the ground. As you can see, I have my little nest with coffee cup, thread, scissors and remote controls handy. My ancient little TV bit the dust during the transition, so yesterday I got a new small flat screen so I can watch my cheesy disaster movies while I quilt. Truly my little bit of heaven on earth. The yarn is Dream in Color Smooshy, color Into the Mystic, pattern Sunshine by Cookie A. This afternoon I get to go meet with my dear friends in my Round Robin group. I do so love this group of ladies and we always have such a wonderful time! Next week I'll try to get my act together and show you what we're working on. 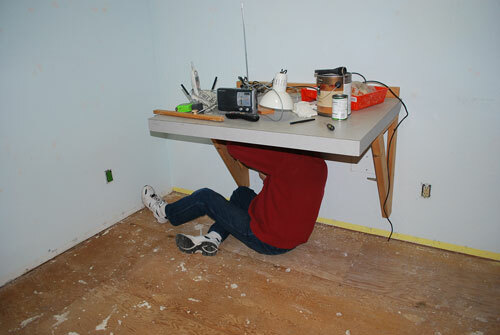 Work table – hubby built this work table for me years ago and it is wonderful! It's at a nice height for standing and there's a stool if I want to sit down. All of my fabric cutting is done here. Although I use a MacBook for my every day computing, I use hubby's old PC for my embroidery and sewing programs that only run on a PC. I could use Boot Camp, but this is handier. 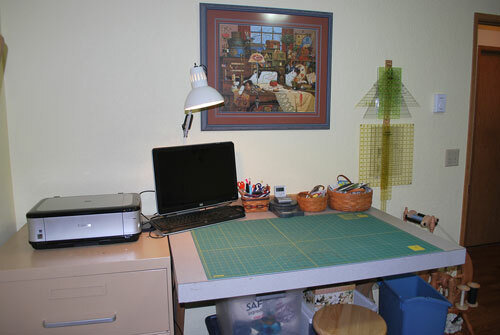 I have my good photo printer to the left and to the right are my quilting rulers, right at hand when I need them. Above the table is a print by one of my favorite artists, Charles Wysocki. We have several of his signed and numbered prints. Although the table is constructed so that it can fold down, we've never had it folded down! And I use underneath for yarn storage bins. Bookcase – I did some weeding out of books, so the bookcase is not as crowded as it used to be (believe it or not!). They are roughly sorted by knitting/quilting/other, but probably more weeding out and organizing needs to be done. I'd like to get the knitting books organized on Ravelry. The corner unit holds my "entertainment center" consisting of the TV/Tivo/DVD player. I often have recorded CSI and Law and Order programs going on in the background while I work. 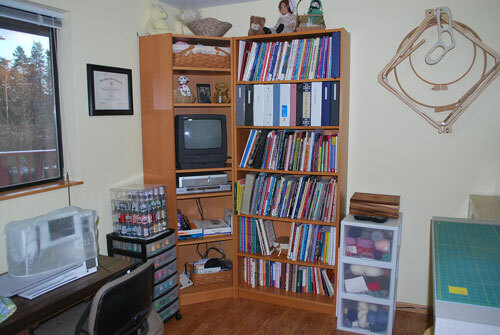 To the right is a hook holding my large quilting hoops and more yarn storage bins. To the left is my cart of embroidery threads. 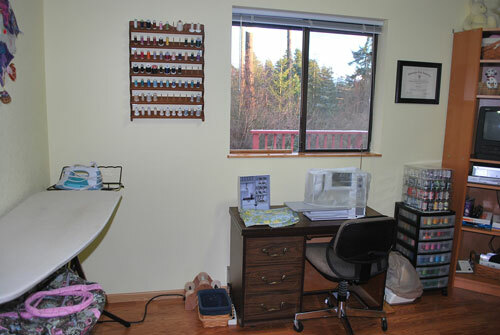 Sewing Center – I have an old and yes, a little ugly sewing cabinet, but it was free and is really a great piece of furniture if you get beyond the looks. 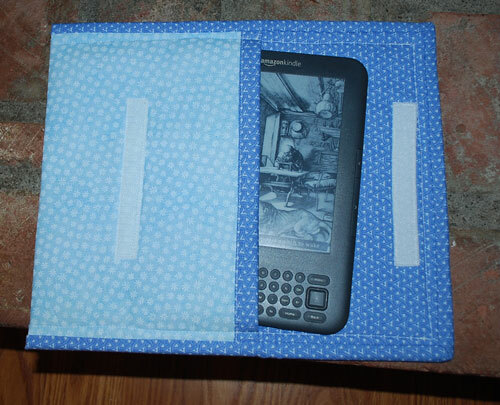 For one, it's terribly sturdy – no wobbling or shaking, even when I put the pedal to the metal while sewing. It's got storage drawers on the left, which really need to be sorted out. It also can pull out from the wall and has a table that folds out, giving me a very large surface for machine quilting or when I just need more room. 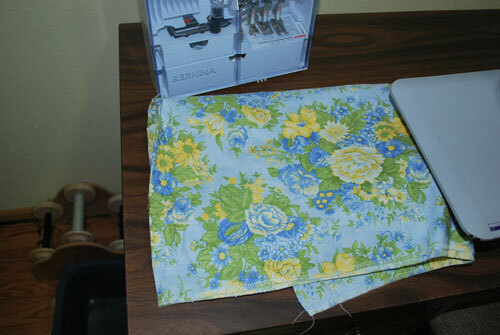 My serger is on the floor to the right and can easily be put on the fold out when needed. 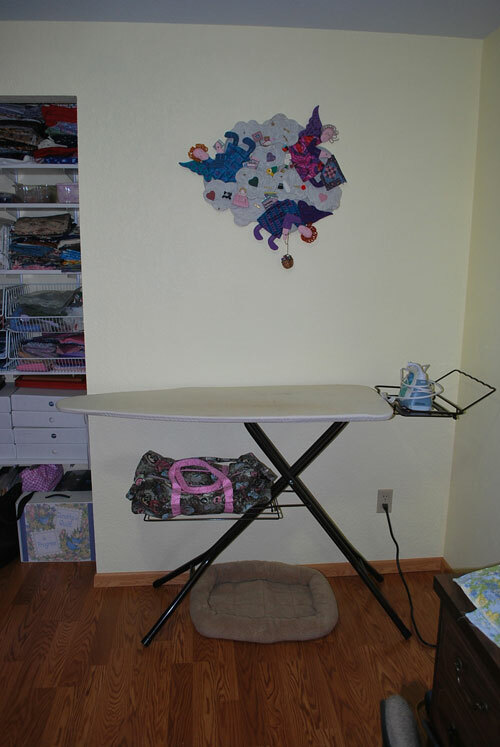 Ironing Center/Doggie Relaxation Center – My iron and ironing board are handy, just a few steps away from the sewing machine. I could lower the board so I could just roll over from the machine, but I find the getting up and down actually is better for my body. Whenever I'm in my room, Maggie is usually there with me. Since there is no longer carpet, I thought a doggie bed would be comfortable for her. She hasn't yet claimed it as her own, but I'm sure she will once I start working in there. 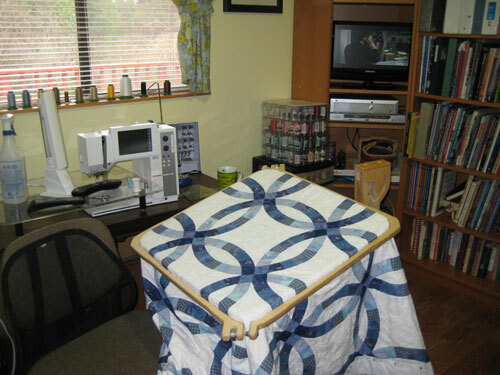 On the wall above the ironing board is a wonderful quilt – Quilter's Heaven – made by a dear quilting friend. I had always admired the quilt and was constantly talking about it. One day she offered to sell it to me. I was envisioning hundreds of dollars, but all she asked for was a pittance. I gave her twice what she offered and said if that bothered her she could donate it somewhere, which I think she did. I love this quilt and especially the connection to my friend, who will be moving to Florida this year. 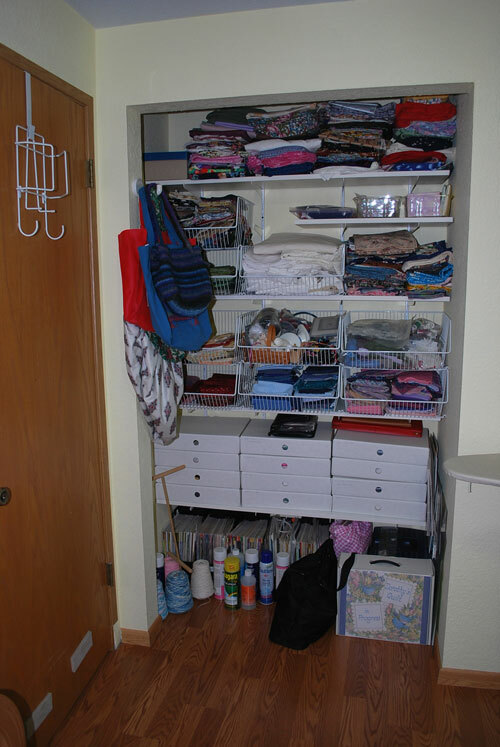 Fabric Stash Closet – here you see my fabric stash. The wire bins come in handy for sorting by color. I've also found that the clear plastic containers that our salad comes in are great for holding small pieces such as fat quarters. The white cardboard boxes hold projects. My goal this year is the get some of these done and the boxes emptied for new projects! The hook on the left holds all my tote bags (you can never have too many tote bags). On the floor is room for magazine storage and assorted sundries. At times my magazine collection has threatened to take over the house, and in all honesty I must admit that I have a whole shelf of them in our master bedroom closet. But I have already cleaned out a ton and will continue to destash them through the year, tearing out articles and patterns, filing them in notebooks and recycling the rest. My goal will be to have no more magazines than will fit on the floor of this closet! So there you have my room. I did notice that because of the flash, the color looks a little washed out. 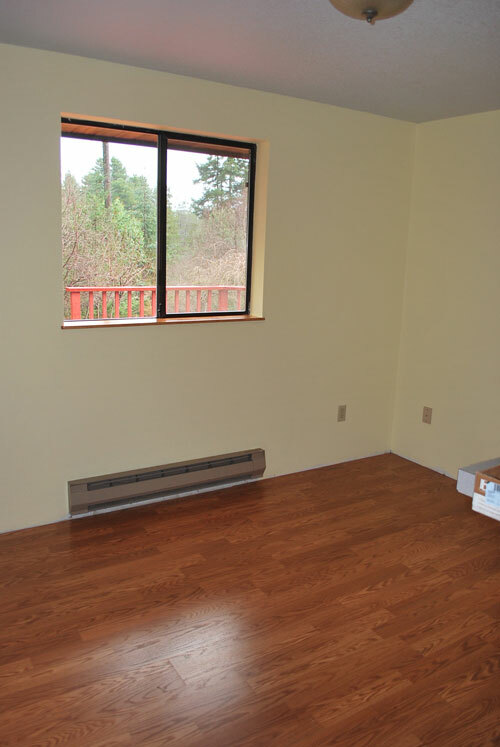 It is really a nice, warm, sunshiney yellow. It is such a refuge for me and I really love that I have the luxury of this space. Technically, it's not finished because I still need to make curtains. Believe it or not, in the 25 years we have lived in this house, that window has never had curtains! I think it's about time. 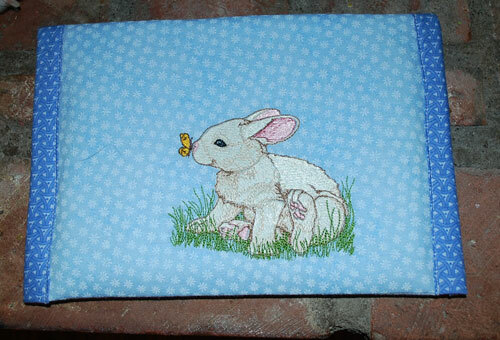 The fabric you see on the sewing table should find itself on the window within the next week or so. I don't know if you can see out the window, but there is a light dusting of snow. We had pretty heavy snowfall this morning, but it was warm and didn't stick too much. However, the weather pundits here have predicted a major snow "event" for later in the week. We made a trip to the grocery store this morning to stock up on a few items, so we are well prepared. A perfect excuse to hunker down in my beautiful new room. Bring it on!! It's really hard to get a panaromic shot of the whole room. I love the cheerful yellow walls! In fact, as I was walking down the hall this morning I wondered if I had left a light on in the room. I hadn't, but the walls were reflecting the rather weak light coming in through the window. It's been so grey and dreary here the past few days and the sunshine yellow walls made me happy. All that's left is for hubby to put down the molding and we'll be done! I've found myself really at loose ends today. 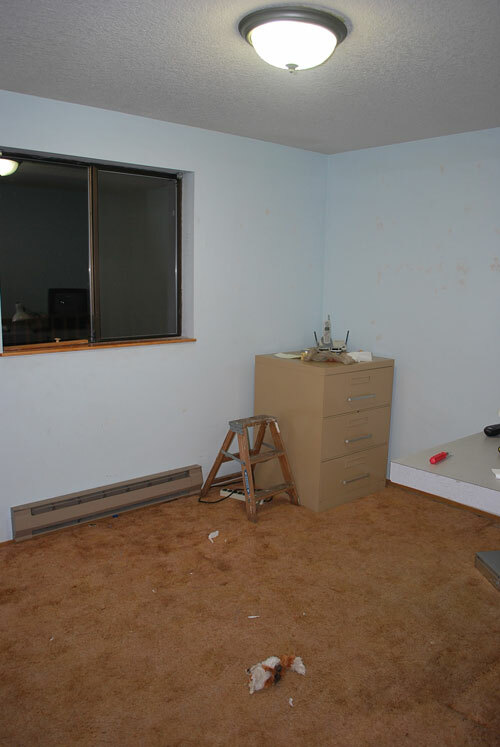 Up until today, I've been busy on the project – cleaning out and painting. Once he started on the floors, there really wasn't much I could do to help. 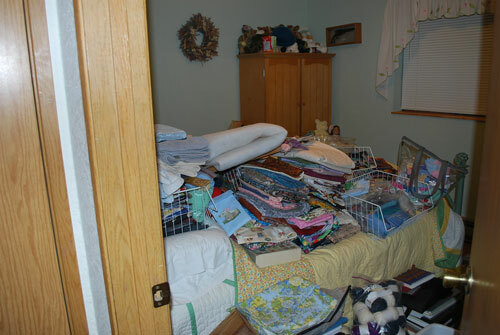 I can't clean the house because there's sewing room junk scattered through just about every room. 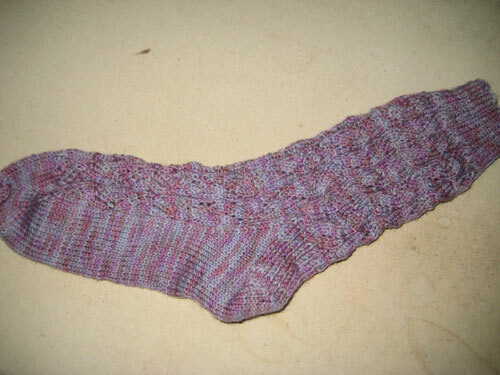 I finished the socks I was knitting and can't start new ones because my sock yarn is buried, to say nothing of my swift and ball winder. I did find the yarn and pattern for the sleeves on Isobel's sweater, but I changed the colors on the chart and did not mark the chart. So I need the body in order to match the colors. I have no idea where it is right now! I should name this "Still Life of Socks with Thread". Still can't find the ball band so I can't credit the yarn yet. I did run across it during the cleaning out, but who knows where I put it?? 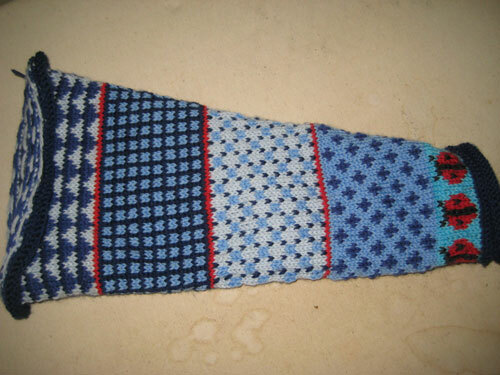 This is the first pair of six for my sister's "Sock Club" this year. I'm rather proud of myself that I am so far ahead. We'll see how long this lasts. Less than an hour and I can start moving things back! I can't wait to be able to sew and find things again. Before it gets better . . . It's got to get worse – a lot worse! 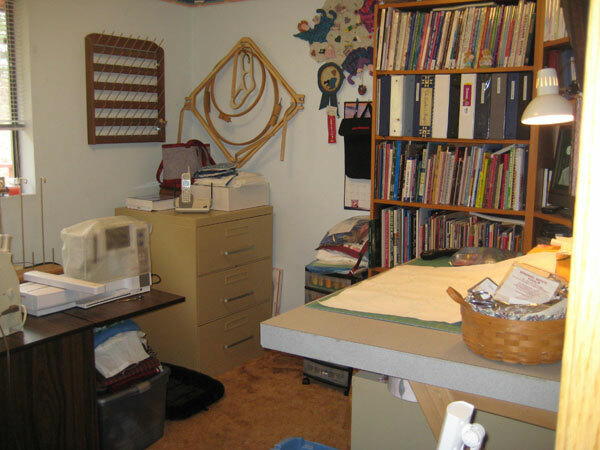 Hubby and I have been putting off a remodeling project in my sewing room. We want to put in a new floor and while we're at it texturize two walls that were never done when the house was built and repaint. Because we knew it was going to be a HUGE hassle, we have been procrastinating. However, the time has come and it is now. That doesn't include the floor to ceiling bookcases in the bathroom and dining room, or the piles of stuff in the sunroom and our bedroom. I'm not sure how in the world I fit everything in there! I did do a lot of cleaning out and have boxes to give away, plus a box of books I sold at Cash 4 Books and some stuff that has gone to the thrift shop. 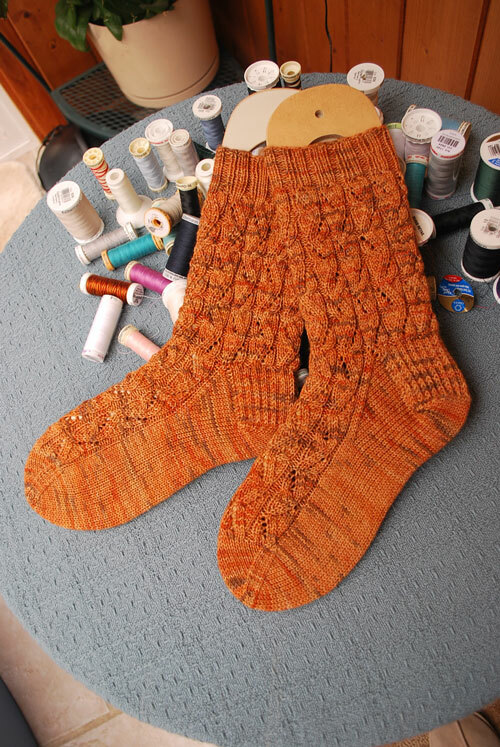 I'm already having withdrawal – I really want to sew! But with a lot of hard work, by this time next week I should be moving stuff back in. Here's hubby hard at work! This was the second attempt. The first was a pouch with some really strange directions. So far I have to say I love the Kindle. It took a little getting used to the navigation, but I love how lightweight it is and the ability to store so many books. I find myself spending way too much time playing word games on it, but I justify that by reminding myself it staves off dementia. Right? 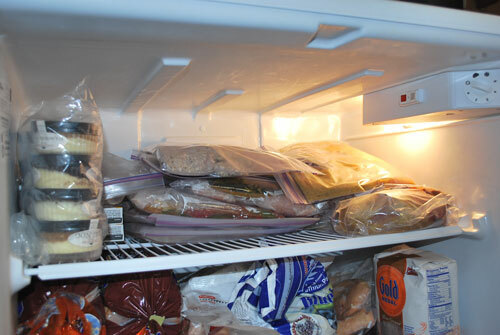 While hubby is prepping the room for painting, I've been in the kitchen putting together some freezer meals. A couple of years ago we went to a store called Dinners Ready. You could go there and put together meals for the freezer. Then, when you found yourself standing in front of the cupboard wondering "What's for dinner? ", you could just pull a meal ready-to-cook out of the freezer. It was a little more expensive than home made, but not quite as expensive as eating out. The downside was your choices were pretty limited and the store closed after only a year or so. But recently I found the site SavingDinner.com. She has recipes for freezer meals. After trying a few during December, and being really impressed, I am ready to go for broke. I put together 15 meals this afternoon! Of course, we may end up with take-out tonight because I'll be too tired to cook, but it should keep us in good shape for the next few weeks. And I'm starting to look at my own recipes with the idea of preparing them ahead of time and freezing. I'll keep you posted on our progress.